According to my short travel notes after our failed vine festival visit we rented a car and went to the North of the island. It wasn’t a problem to rent a car in our place, there is a bunch of them on every corner and the prices are relatively the same. Nobody asked us for international driver license, regular Russian one was fine. So we rented sky-blue Nissan Micra and floored to the North. The first point of destination was Cape Formentor and Beacon standing there. Нашим первым пунктом назначения на тот момент был Мыс Форментор и маяк, построенный там. 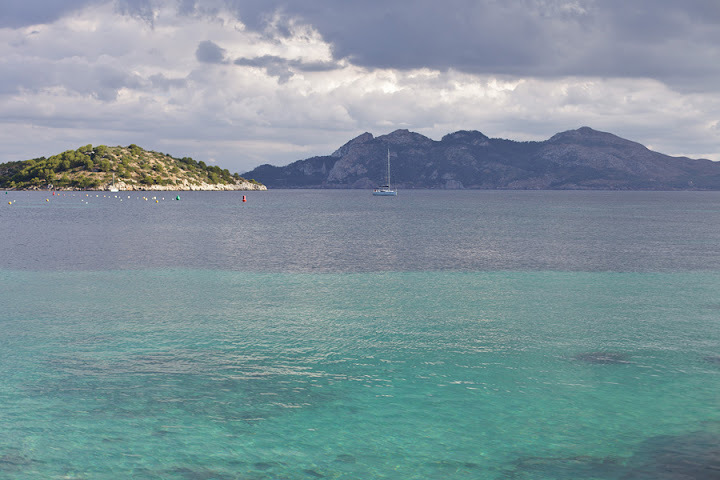 The road to the Cape Formentor is a serpentine through growing higher and higher mountains. It has a lot of view-points where you can park and spend some time looking down at the sea or go crazy as I was and shoot a lot of similar marine photos. We haven’t read anything about this place and all we had was an idea of how it should look. I imagined high lighthouse painted in red-white stripes and with the huge lamp surrounded by lenses on the top of it. И вот когда наша микра с огромным трудом вскарабкалась на площадку у маяка, припарковалась на практически вертикальном склоне, и мы продрались сквозь толпу машин, коз и туристов (что зачастую одно и тоже), мы увидели это…самый разочаровывающий маяк в моей жизни, тусклое бело-серое низкое здание с лампой на крыше. В цокольном этаже расположено небольшое кафе с видами на окрестности. На автобусе я так туда нельзя подъехать;экскурсии, видимо, начинаются значительно ниже, на предыдущей смотровой площадке. Для людей с больными ногами или спиной подъем может оказаться тяжелым испытанием, да и, честно говоря, даже для здорового человека подъем по крутым лесенкам и останкам древних дорожек по жаре может быть опасен. But when our car dying from the vertical road parked at that tiny parking and we reached the point of our destination, that was it! Disappointment! All we saw was a white-grey building with the restaurant on the ground floor surrounded by chainlink fence. People says that this beacon was built in 1857, but it is hard to believe, maybe it was recently renovated. Наразочаровывавшись вдоволь, мы начали спускаться обратно, к пляжу у подножия мыса. Deeply disappointed but still in good mood we started our descent from the cape to the beach Formentor. Вокруг пляжа царит красота: сосны, песочек, домики..а сам пляж и небольшая бухта будто сошли с полотен импрессионистов: там нет обычных цветов, только ультра-насыщенные оттенки, если сосна зеленая, то она цвета весенней хвои; если вода голубая, то как небо…ну судите сами..Само место напоминает мне прибалтийские дюны, только тут тепло и море красивее и прозрачнее. And heaven blessed us there.. no! it was like in heavens itself! The beach is the revived canvas of Impressionism. All colors are very bright and shiny, sea full of clear blue water, sand as yolk, pines so green as if they were drawn by a child. And air..all I wanted was the possibility to put some air in the jar and take it with me! That place reminded me Lithuanian beaches with their pine dunes, but they don’t have such warm and clean sea. Мы были околдованы этим местом, единственное, что смутило, так это платный заезд на территорию фешенебельного отеля Форментор около пляжа, 10 евро, кажется..около въезда на территорию есть еще одна парковка, стоянка на ней стоит 6 евро. Мы не растерялись, поставили машину в пяти метрах от шлагбаума на обочине бесплатно и прошли целых два шага до пляжа. After fresh-air session we hop on our car and drove to Alcudia, one of the places on Mallorca which are available for kiting this time of the year. But as usually when we arrived there was no wind at all and as a result nobody was in kite- or surf schools. So we decided to spend the rest of the day in the city Alcudia. This city has a very rich history full of Roman and Arabian presence. The old part of the city is surrounded by a medieval wall. All we were doing there was fooling around, looking at windows of souvenir shops, gazing at people, trying to examine the ruins of the ancient Roman town Pollentia through the closed gates of the fence. We saw the remains of bases and several columns. That wasn’t fascinating. Really, cause if you want to look at ancient civilizations remains in different condition you will need to visit Greece or Italy. But we were just glad to be together on our vacations there on Mallorca, happy and relaxed we came back to Arenal to swim in the last rays of the sun. Так как мы поздно приехали, то уже никуда не попали, побродили просто по улочкам, посмотрели на народ..а так можно было бы заглянуть в Римский город Pollentia (не знаю, как правильно написать по-русски=), посмотреть на остатки фундамента, но вход уже был закрыт. Так что пришлось заценить пару колонн времен начала нашего тысячелетия через забор и поехать к себе в Ареналь купаться в полном одиночестве под заходящим солнцем. Впечатляющие фото. Небо над Майоркой получилось очень красивым.